jim_trelease, originally uploaded by pplflickr. The library has teamed up with several PTOs and the local school board to make this event happen. 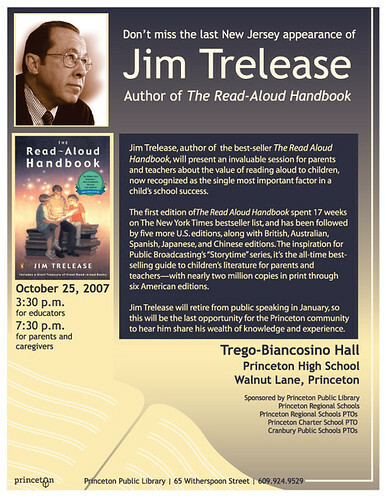 Trego-Biancosino Hall at Princeton High School seats 770, but arrive early as this free event is sure to draw a crowd. I heart Jim Trelease. I was lucky enough to hear him in my undergraduate years. Go, enjoy, be entertained, get good talking points!